Needs a shot of Vi@gr@ on the rocks. Ya can't have Dalek without dk. "Picture a lonely black hole, spinning in space. Thanks to its spin and charge, it has both a magnetic and an electric field. Without quantum mechanics, nothing happens; roll credits. " 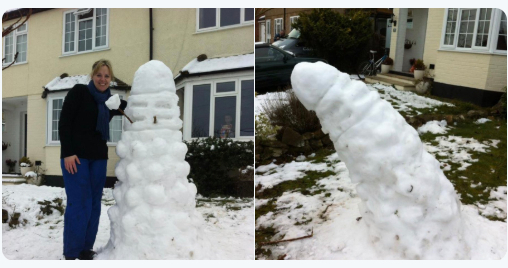 Please consult your Doctor Who if your snow dalek lasts for more than four hours. This is where I thought sea monkeys came from. Geez, what was in your coffee this morning? Think he has sampled some of the local flora. Very fine faces on both sides. To be fair, if his face was any larger it just wouldn't fit on the corncob. We had it all night, until it turned to snow. Brief respite between storms now, which is nice. Sez here it's gonna be a wet week. Supposed to begin improving here Wednesday. Six moose weeks of winter. We saved plenty for you.